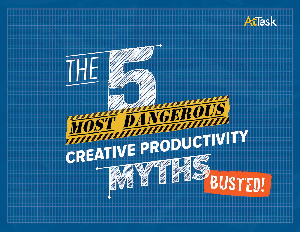 > Workfront > The 5 Most Dangerous Creative Productivity Myths—BUSTED! Tips for improving your creative work productivity. Your usual methods for getting loads of work done are are bogging you down. Surprised? You’re not alone. Adding resources, sending more email and “keeping busy” are common strategies most marketers endorse without knowing the real consequences. Don’t be in the dark.